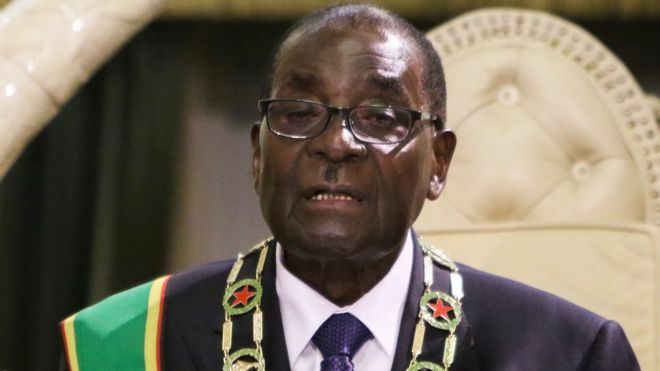 Harare, Nov 20: Robert Mugabe has agreed to stand down as Zimbabwean President following a military takeover earlier this week. A source close to the ailing leader quoted by the Independent online said he was reportedly working on his resignation statement ahead of a live address to the nation which is due to be televised later this evening. The ZBC state broadcaster confirmed that Mugabe would address the nation shortly from his official State House office in the capital Harare. The 93-year-old had previously refused to step down despite being under house arrest since Wednesday after the military launched a takeover. Earlier on Sunday, the ruling party, Zanu-PF, held a meeting of its central committee where they removed him as the head of the party and warned that he must resign or face impeachment. It also appointed his former Vice President Emmerson Mnangagwa as the new leader. Mugabe sacked Mnangagwa as Vice President two weeks ago had prompted an extraordinary chain of events as the military intervened to block the 93-year-old President from installing his wife Grace in his place. The President was due on Sunday to meet the Army commanders who took power last week, a statement broadcast by the state-run TV channel said. The face-to-face encounter is only the second since the military takeover five days ago. Parliament is expected to start impeachment proceedings next week. Tens of thousands of Zimbabweans attended street protests on Saturday to demonstrate against the Mugabes. The first lady has been expelled from the party altogether. The BBC reported that cheering erupted as the decision to sack Mugabe was announced although the move has yet to be formalised. But it increases further the pressure on Mugabe that has been building over the past few days. There were now moves to impeach him as President. The head of the influential War Veterans Association, Chris Mutsvangwa, threatened to "bring back the crowds and they will do their business" if Mugabe did not step down. Mugabe has been President of Zimbabwe for 37 long years. Mugabe's downfall is likely to send shockwaves across Africa, where a number of entrenched autocratic leaders, from Uganda's Yoweri Museveni to the Democratic Republic of Congo's Joseph Kabila, are facing pressure to step aside. Mugabe, who has ruled Zimbabwe since the end of white-minority rule in 1980, was reportedly trying desperately to cling onto power and was believed to be in talks with the head of the armed forces, General Constantino Chiwenga, to negotiate the terms of his resignation. It is unclear what deal he has agreed and whether this will include protection from prosecution for him or his wife, Grace Mugabe.